Every year classrooms all over the world establish their class rules. There are many ways to do go about this, but if you really want your students to follow the rules they have to have ownership of them, be accountable for themselves, and for the process. Using PBL methodology Mrs. Ellington's second grade class was given the autonomy to create a set of class rules. Working in groups students came to consensus on three simple rules. This covered pretty much any scenario students might face in a typical day and it was a great way to use PBL to let the students have control and think through the same process a teacher does each year. This seems like a simple thing, but it's really not. Students are constructing knowledge, discussing collaboratively, coming to agreement or arguing their points constructively, and bringing back possible rules for students to follow. Thinking at that level is hard, but it develops problem solvers and begins to get students to think about applying these skills in other areas. 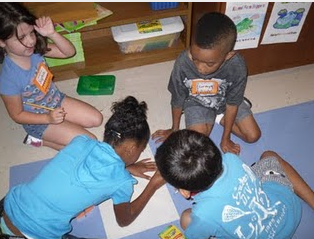 Check out Mrs. Ellington's post on her class blog and leave a comment!